To reinforce that digital message, you’ll need to start with a logo design that works for your social-media pages, your website, apparel and your printed materials. Consider choosing a simple and colorful graphic to tie all your campaign literature together in the minds of your voters. 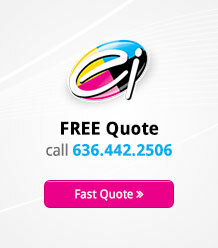 Working with a professional logo design team, you can find the image and colors that best convey your message. Patriotic colors like red, white, and blue are always safe choices, but remember that you do have other options. For instance, if you are running on a platform of environmental awareness, a vibrant green might reinforce that message. Your color and design choice should say something about you and your campaign. Once you have your logo identity, you can kick your campaign into high gear. 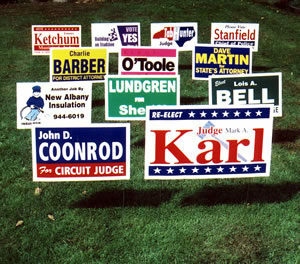 As your campaign gains momentum, you’ll want to focus on both traditional means of advertising in political campaigns, like yard signs, and more innovative marketing techniques, like vehicle magnets. Depending on your local area and your driving habits, car magnets can be a great passive-marketing technique that never gets turned off. Whether your supporter is at the grocery store or on their way to work, the car magnet provides a continuous opportunity for your brand to be seen. Much like your business cards, this is a chance to send potential voters to your website or Facebook page to get more information about you and your candidacy. Vinyl banners are great for campaign events or for identifying your booth at everything from county fairs to a meet-the-candidates night. Traditional overhead banners can be paired with retractable banner stands to provide information about you and the things that you are promoting in your campaign. Your campaign headquarters are another opportunity to reinforce your digital marketing message. You’ll want official campaign stationery to send out media releases, responses to voter inquiries and any other official correspondence. Having office note pads and coffee mugs that sport your campaign logo can also serve as a reminder to campaign staff what their focus is. Additionally, supporters may wish to purchase mugs as a means to demonstrate their support. Your office will also need to be a supply house for volunteers and supporters. Whether it’s door hangers, bumper stickers or yard signs, your supporters will expect a variety of ways to make their candidate preference known. When you have canvassers out talking to potential voters, supplying them with imprinted tote bags to carry campaign materials in is another way to subtly increase your name recognition and direct people back to your digital marketing efforts. One of the hallmarks of campaign season is the effort of candidates to get out and meet voters. Whether it’s a personal appearance at the local senior citizens’ center, holiday parades, or an actual door-to-door campaign, you’ll need brochures targeted to that potential group of voters. Now is the time to explain your platform and voting record. At large public events, chances are that voters will see a lot of different candidates. Your print materials should reinforce the messages that you gave at the event. They should encourage potential supporters to vote for you and even to donate to your campaign. At this type of event, imprinted bags that have been pre-stuffed with campaign literature can be one of your most effective forms of print marketing. Large public events are also a good time to have buttons, magnets, and bumper stickers available to encourage supporters to help you get the word out.